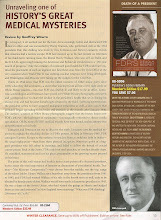 Since the presently held view of FDR's life is still the one perpetuated by Howard Bruenn, James MacGregor Burns and the Roosevelt family in 1970, I decided to write a fairy tale of my own. Eventually, video will be added and it will be posted on You Tube. Once upon a time there was a handsome young prince named Franklin who was born in a castle aside the river that flows to the great city. He lived in great privilege and comfort, the only child of a Duke and Dutchess born of the families that long ago had come across the sea and settled in Gotham in the Land of Freedom. It was the Prince’s destiny to become a great King of the Land of Freedom, but only should he marry a duckling with whom he must remain for the entirety of his mortal life. For the duckling was also a scion, and though homely of countenance was most attractive to the Prince as she was the favorite of her uncle, the King of Sagamore by the bay, whom the Prince wished to follow into greatness. The Prince had been lonely as he was schooled in the ways of the world cloistered in his castle until a young man. After fourteen years, the Prince was dispatched to a School of Princes and then to the great College of Princes near the City of the Bay as had the KIng of Sagamore before him. When the Duke died the Minister of the School of Princes did offer him solace and wise counsel as though a father. The Duckling was forlorn as well, as her mother had died when she was but eight and her father, the brother of the King of Sagamore, had passed on soon after under an evil spell that very early took him from the land of Gotham, never to return. Much to the consternation of the Dutchess, the Prince did court the Duckling, and she soon fell under his powerful spell. At the royal wedding the Minister did preside and the Prince felt duly regal as the King of Sagamore delivered the Duckling to him. For a time, they lived happily in the land beside the river and summered on an island of beauty in the north, and she bore him five chicks. Soon after, the Prince came upon a Gnome who was a soothsayer and prophet of his greatness and together they set out upon the golden road to win his kingdom. The Prince won praise as a fighter of the Tigers who had come to rule his domain and when the Prince was struck ill of fever the Gnome did most admirably advocate for him. With the Gnome at his side, the Prince departed the land of Gotham for the City of KIngs to assist the leader of the soldiers of the sea. He was pleased, for the vessels of the sea had always brought him great joy and again he did continue in the footsteps of the King of Sagamore. The leader afforded the Prince great power in the City of KIngs and it made him feel strong. Here he met a Spider who was a herald and spoke well of his deeds. But now the prince came upon a beautiful Swan, for whom he felt great love and wished to sacrifice the prospect of his future kingdom. The Duckling, who had been forewarned, came upon letters that spoke of the Prince’s affection for the Swan. With great vigor the Dutchess and the Duckling beseeched the Prince that the Swan, however beautiful, must be cast aside, for they both desired him to be King in their own way and he could never be so in her presence. And the Prince most reluctantly consented, for the prospect his Kingdom was most alluring, but for his transgression of passion the Duckling did now forever bar him from her most intimate affections. And so the Prince and the Gnome continued their journey on the golden road. All appeared well as the Prince was acclaimed across the land. But alas, one day whilst summering on the beautiful island he was most unexpectedly struck down by a crippling plague that for a time stripped him of his royal demeanor. Possessed of great determination, he would again take up his quest, with the help of the Gnome, the Duckling, and now a Goose who had come to assist him. On withered legs for all to see the Prince most bravely sung the praises of a Warrior of the Tigers who wished to be king, but the power of the Elephants who ruled the land was too great. Yet the people had come to know of the Prince’s courage and he was pleased. Though forever smitten by the Swan, who had found a measure of contentment with an elder Cygnet far from the land of Gotham, the Prince came to admire the Goose, who attended to his needs and fell most deeply under his spell, and with whom he did consort as the Duckling and the Chicks accepted with quiet resignation, for the Prince was indeed of greatness and the providence and expectation of his future kingdom was paramount to all. And the Prince built the Duckling a cottage on the creek of Val Kill near the castle of the Dutchess, where she lived with a nest of ducklings with whom she flourished and built a royal domain of her own. Soon the Duckling came upon a Hen, a herald and scribe as had been the Gnome, with whom she would share great affection. And when the Wizard of the withering plague died, the Prince, with the Goose at his side on the raft Larooco and then beside the waters of the great Warm Spring of the south did himself become a great Wizard. As he was most enamored of the healing waters, he took nearly all the gold he possessed and purchased the land so that others of the plague might be restored as well. And he sought the counsel of a Wizard of the Sea whom he had befriended during their service to the King of the Great War. And now a Knight of Eire came to him to hasten his journey to the throne. For the Knight was a maker of Kings and had done good deeds in the service of the King of the Tigers. A time of great decision arose as the Prince was implored to govern the land of Gotham as had the King the Sagamore before him. And though his legs were yet withered, the time was ripe and he cast aside his wizardly endeavors to pursue his destiny with the greatest of vigor. The Duckling was torn, for her cottage and her court were now most comfortable and she knew that great changes would come to pass and that her life could never be the same. Indeed, she went with the Prince, for now she loved him as a brother and wished not to cast a shadow upon his dream. And it came to pass that the elephants had governed poorly and a great famine came upon the people of the Land of Freedom, for the bankers and brokers in the city of Gotham did act most unwisely. (alas, a most similar misfortune would come to pass three score and ten years hence, for, in this case, the elephants had forgotten!). And the people rose up and did mandate the Prince to ascend to the throne and restore them to prosperity. At his coronation, the new King spoke to the people most eloquently and forcefully to assuage their fears. The Wizard of the Sea presided and saw that the Swan, who had indeed remained spellbound, could bear witness. And the Wizard brought a second Wizard to attend to the King and with him a Fox to soothe him as he had done for the King of the Great War in his years of infirmity. And he brought a loyal Lion as well, to ease the King’s burden and to walk with him. The King was pleased and took the new Wizard, the Lion and the Fox into his most intimate court. Now the new King Franklin and his Goose and the new Queen and her Hen all took residence, along with the Gnome, in the royal White Castle in the City of Kings. As never before, a whirlwind of great changes came to pass. To bring the people out from the abyss that the elephants had created, the new King enlisted a parliament of owls most learned in the ways of the world, a shepherdess of the laborers he had long known, given power that no woman had known before and a Greyhound to rightly administer the good offices of a New Deal that he had conceived. And the offices bore names of but letters of the alphabet that in turn became symbols of a spirit of hope and restored prosperity. The Greyhound returned the people to work to rebuild the land and as he had promised most emphatically, the new King did champion the repeal of the prohibition of drink that had been most unwisely imposed. As no King had done before he did banter most regularly with a gaggle of heralds that the Spider had gathered. And they spoke well of him, for had they not, they most surely would have fallen from favor and been banished. And as if magic he spoke to the people in their homes as they sat beside the hearth to tell of his good deeds and assure them that their future would be bright, and he curried great favor in their hearts and minds. And the many fruits of his good deeds remain, celebrated by his subjects whom he and the shepherdess endowed with comfort in their later years as none had been known before and by the sons and daughters of his warriors to whom he gave a gift of learning after their days of battle, and for the hope he exuded and the passion he showed for ruling his kingdom during a reign of unprecedented and never to be repeated duration. As the KIng was now most powerful, he no longer wished the people to think of his withered legs as he wanted to appear most strong in their eyes, so he commanded the Spider to spin a web whereupon the image makers would not show it, nor the heralds speak of it. And as he was often unwell, the King commanded the Spider and the Second Wizard to spin webs to assure the heralds and the people that he was strong. As the Gnome was now weak of body, the Greyhound rose to a position of great favor, but then he too fell most gravely ill. Though relieved by a miracle of the knife, he was left forever wanting of sustenance and the King enlisted the Wizards of the Sea to sustain him. By great fortune this was so. Yet, alas, as the King performed good deeds and the people did most convincingly mandate his reign for a second time, a more malignant and dread affliction befell him that all the greatest wizards had little power to stop. And its story could never be told, for its curse was so strong that should it had been revealed, the people would no longer permit him to be their King, and this could never come to pass. And its secret was so deep that even the Queen and the Chicks could not know of it, nor of all the great Wizards who would come to fight it. And when the King was troubled that the nine elder trolls of supreme justice did challenge the authority of his reign, he took great measure to diminish their power. But here he did fail, as the people spoke out in rebuke, for even the greatest of kings could not be permitted to undo the scroll of laws that the fathers of their land had written and that he had sworn twice to protect. And as the Gnome had died, the Greyhound took his place in the great White Castle so that his King might be best served. There came a time where the King did need the people to affirm his reign for a third time, as no King had done before. But this was a time when his mortal body felt most unwell as the Wizards did valiantly fight the great curse. In a moment of despair the King told the Knight of his weariness, and the Knight took it as a sign that he might not seek to remain on the throne. For a time, the Knight aspired to assume it. After a voyage of healing and a period of great consternation, the King was restored, and though the Knight withdrew, as the mythical Icarus of yore, he had flown too close to the sun and was forever banished from the royal court. Through all, the people knew little of the Goose who had sustained and nurtured their King until she herself fell silent. For the Queen had achieved a greatness of her own measure, as she had roved far and wide and became known as a champion of goodness and freedom. As such the people were happy with the image of togetherness of the King and Queen, knowing not that they lived in separate cottages with separate courts to attend them. Now a great war was raging in foreign lands and the King dispatched the Greyhound to meet with a golden-throated Bulldog of the great island in the Atlantic, whose domain had nearly been conquered by a most evil Brown Ogre. And the Greyhound told the King of the power of the Bulldog. As the King and the Bulldog were kindred spirits they came together to lay down a charter of freedom and a plan for the future of the world. And the King spoke eloquently of his nation as an Arsenal of Democracy and thus did sustain the domain of the Bulldog with loans of goods, even as a great Eagle and the many that followed him did most vigorously disapprove. And the King spoke most eloquently that all peoples of the world should be free of hunger, fear and want and that they might worship without incumbrance. But yet again the King’s mortal body would fail him, for as he spoke at the home of the King of the Great War in the valley of the river Shenandoah he fell gravely ill with a dearth of blood that robbed him of his strength. And though he nearly died, the Spider and the Second Wizard spun a web and the people were be told but little of it, yet all the King’s Wizards could not discover of what had afflicted him. After an image he had drawn, the King built a great temple of health on the healing land of Bethesda, so that the Wizards might best sustain him and to soothe the wounds of the soldiers of battle. And in great secrecy he went there often to be restored. And as he now knew that the curse would surely return to take him, he built a library next to the castle of the Dutchess, as no King had done before, to preserve the images he had created. In his repository, he placed documents that did attest to his greatness yet little that spoke of his infirmities and none of his most secret affliction. And he beseeched the deeply spellbound Maiden of Wilderstein to assist him, and she most gladly followed, for he had often spoken to her with an intimacy as only few had known. And when the Dutchess died, a great oak on her land fell as though an omen of her passing. For her castle was now but an ornament, as the King had built a cottage of his own and the Queen had been long absent. Now it came to pass that leaders of the evil Empire of the Rising Sun did without notice most dastardly smite the vessels of the Land of Freedom. In his finest hour, he gallantly spoke of a day of infamy and of how his people would prevail and his words became a rallying cry and his voice and image sentinels of freedom. And the screams of the Eagle were most abruptly silenced. And as the Cygnet had died, the Swan came again to comfort the King, as did a princess of the land of Odin. As the Ogre and a Black Duke of Italy had joined the Empire of the Rising Sun to form an axis of evil, the King sent the Greyhound to a Red Bear of the east who had been crossed by the Ogre. And the Greyhound told him of how the Bear could help him fight the Ogre. With the greatest power of all, the King joined the Bulldog, the Bear and a Blue Dragon of the Orient, and led them in their fight against the axis. The King traveled with the Bulldog to the land of the Moors to plan great battles and most surprisingly declared that he would offer no mercy to the evil axis. And there they met with a pompous Peacock of Gaul whose domain had been conquered by the Ogre. And then he traveled to the land of the Persians to lay his eyes upon the Bear. With a most reluctant Bulldog, they did plan a time that a great invasion of the Ogre’s fortress would come to pass and they spoke in earnest of the shape of the world after the evil axis had been conquered. But, alas, while in the land of the Persians a great pain came upon the KIng that was a harbinger of the return of the dreaded curse. And the Second Wizard did most surreptitiously bring a flock of Great Wizards of the Knife to attend him, but the curse had spread within his mortal body and could no longer be excised. And the vigor of the King did now inexorably decline, for now his stout heart did also fail. And though the die had been cast, the second Wizard brought a powerful third Wizard of the heart to hold off the angel of death. the kings of the world so that his memory would be forever honored, as he had borne witness to failure of the King of The Great War to do so, and how it had devastated him. And when the kingmakers saw their King was weakened, they did enquire as to whom might succeed to his throne, but the King cared little for who was chosen, for his waning powers were now consumed by his Temple of Peace. The King planned a meetings with the Bulldog to speak of the great invasion and to be at his side on the great day, but he had not the strength to make the journeys. And he went to the Temple at Bethesda and the Wizard of the Heart was most appalled, for he now knew that only with the most powerful medicines could the King continue his reign. One last time, the Second Wizard called together all of the great Wizards to save their King, but they were powerless. Now the Wizard of the Heart could never leave the King’s side, for he alone could sustain him. And the King was taken to the land of a Baron of the South to be restored, as the first Wizard had done before him. With a roster of afflictions to which weaker men would surely succumb, he valiantly fought on. As he sat with his admirals and generals on a distant island, the Goose died and the King dispatched the Queen to honor her, for though he most dutifully had assured her comfort, he could never bear witness to her weakness. As the voice of the Goose had been silenced in life, so were her writings in death, for the tales they told could never be known. With great effort, the people were made to believe that their King was strong. As if a miracle, before a flock of laborers he most skillfully spun a ribald tale of a dog that the Maiden had given him and the people yet again affirmed him to be their leader. At his last coronation, he called upon all the remaining strength he possessed to speak but briefly and with great discomfort. Hereafter he would stand no more. On their last great voyage, the ailing King and Greyhound and Lion traveled to the Palace of the Emperors on the Black Sea in the land of the Bear. And now the King could no longer hide his weakness. While the Bulldog gasped in horror at the plight of his friend, the wily Bear now knew that he would be strong. Indeed, the King did secretly give him a gift of great power, for without the Bear, his Temple of Peace would be but a sham. And the Bear used the power the King gave him to give strength to a Red Dragon, long a rival of the Blue Dragon who had fought the evil Empire of the Rising Sun long before the world knew of the bad deeds it performed. As he returned the from land of the Bear, the Lion died, and the the King was most despondent, for he had not only lost a loyal courtesan but had been most bitterly reminded that his own time was growing ever short. Soon, he spoke to the people to tell of his vision for the future of the world. But now his legs were too weak to carry him and the voice that had once been a clarion call of hope was now but a whisper, and the portent of death loomed on his countenance for all to see. One last time he returned to the land of the Warm Spring to be restored, but it was not to be so. And when he died, his beloved Swan and devoted Maiden were at his side. And though his body was no more his powerful spell lived on, for the Queen continued in his good deeds and stood in his place at the first gathering of the Temple of Peace and his courtesans continued to sing his praises as the Second Wizard spoke of his vigor and greatness. As a sign of the good he had done for the afflicted, his image was placed upon a coin of his realm, for though he had long put aside his wizardly duties, the day of his birth had become a day of charity and his deeds an inspiration. And it came to pass that the King’s gift of power to the Bear bore bitter fruit, for the new leader of the Land of Freedom had been told little of the goings of the world and the Red Dragon took the power he had been given by the Bear and drove the Blue Dragon from his land. Soon the Dragon and the Bear came together to build a powerful Red Empire and a war of ideas came to pass between the Red Empire and the Kingdoms of Freedom. Once and again, the soldiers of Freedom were called to fight the Red Empire on distant lands but now they could not prevail as when the King was their leader. When the Queen died she was laid to rest beside the King, as though they had always been together. And the spell of the Great King still lives on, as the memory of their togetherness is strong, even as all the royal princes and princess are gone, for the sons and daughters of his sons and daughter wish it so. After the second Wizard died, there came a time that that people began to doubt the tale he had spun. Now it fell upon the third Wizard to weave a yet more tangled tale that he oft retold so convincingly that the recorders of history continue to echo it in their scrolls. And when the Maiden died, she also left a scroll for the world to discover that attested to his greatness but told little of what she had known of the plagues that the Wizards could not conquer. Alas, talk of the greatness and devotion of the noble Goose is but a whisper while the memory of the togetherness of the King and Queen ring loudly in the hearts and minds of those that make the record of history, as though they had always lived ... happily ever after.